The smallest of our tripod family! Stands 6" tall with a 4" adjustable tray. 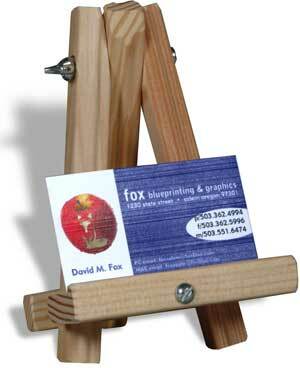 Great for business cards, recipe cards, baseball cards and postcards. Perfect for the classroom project, holds all those precious masterpieces for Mom and Dad. Available in solid oak, natural solid fir or add a dark walnut stain to the fir. **If you have any questions about this product or need to ensure an arrival date please email 4info@americaneasel.com or call 1-877-765-9549.